A Northwestern player harasses an opposing ballhandler. The Wildcats take to the road this weekend to face the Buckeyes and Bobcats. The Wildcats have only two games remaining in conference play, and splitting games this weekend is not an option. In a heartbreaking match, No. 16 Northwestern (10-6, 3-3 Big Ten) lost in overtime to then-No.14 Michigan last Friday, dropping its conference record to 2-3. The Cats then brought their Big Ten record back to .500 with a shutout win over Michigan State on Sunday. But NU does not have the luxury to split games this weekend versus Ohio State and Ohio, as the end of the Big Ten season approaches. After a four-game home stretch, the Cats will travel to Columbus, Ohio for a game with the Buckeyes (8-6, 4-2). Currently, Ohio State sits two spots above NU, so this match will be critical in determining Big Ten Tournament seeding. 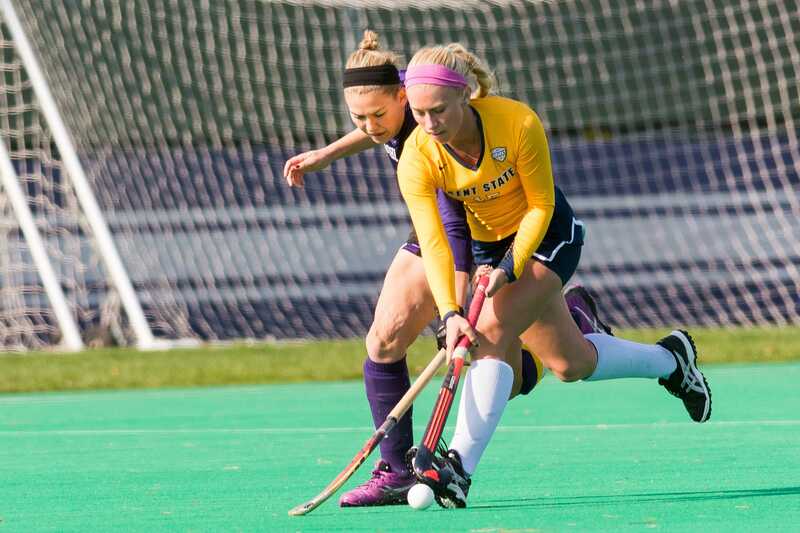 In NU’s victory over Michigan State (5-11, 2-5) on Sunday, the Cats held the Spartans to only taking one shot in 70 minutes. Meanwhile, NU took 25 shots in the same amount of time. The Cats did not concede a single penalty corner during the game against Michigan State, and the defense stifled the Spartans shooters. Senior back Lisa McCarthy contributed two assists off of penalty corners during NU’s shutout and locked down the Spartans’ offense. As well as the defense played against Michigan State, the offense struggled to capitalize on its opportunities when it took on Michigan (13-3, 5-1). The Cats outshot Michigan 20-12, but the team’s inability to finish its penalty corners and slip the ball past the Wolverines keeper proved sufficient enough for NU to come away with a loss. Junior midfielder Dominique Masters put five shots on goal during the Michigan loss, and she said the team has made finishing its opportunities a priority. After the Cats play Ohio State, they will travel from Columbus to Athens, Ohio to take on the Ohio Bobcats (8-6, 3-1 MAC) on Sunday. But Fuchs said the team is taking the schedule one game at a time.